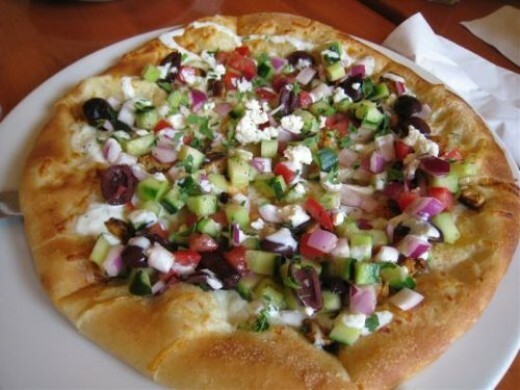 Here is an easy restaurant copycat recipe for California Pizza Kitchen's Greek Pizza. This pizza contains spiced chicken and mozzarella cheese topped with basically a chilled Greek salad of cucumbers, red onions, fresh tomatoes, Greek olives, Feta cheese and an herb infused salad dressing. Read on to learn how to make this salad pizza at home. 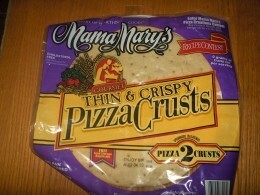 I've never had much luck at making homemade pizza dough so I use prepared pizza shells to make these gourmet pizzas. The shells to the right were bought at Walmart for less than $2 each. Boboli also makes a nice pizza shell. I find that using a shell insures a perfect crust every time. Preheat oven according to shell package directions. Brush shell with olive oil. Shred rotisserie chicken and a spice blend of 1/2 tsp each of cumin, garlic powder, paprika, cinnamon and salt. Pile the chicken and some shredded mozzarella cheese on the pizza and bake. Meanwhile toss all the vegetables in Italian or Greek salad dressing and chill in the refrigerator. When the pizza comes out of the oven top with veggies, black olives and feta cheese. NOTE: The Tzatziki sauce below is optional.